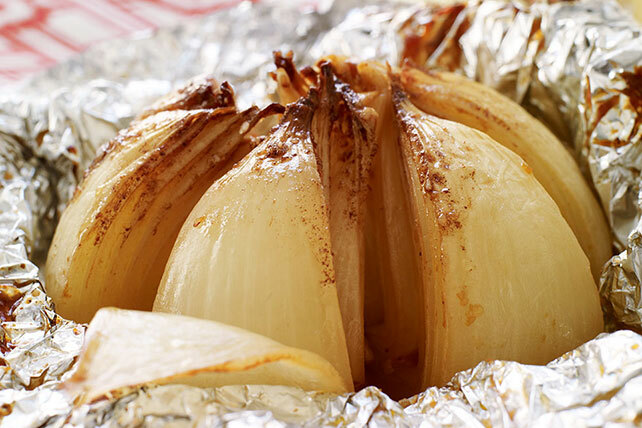 Find the flavor of French onion soup translated into a good-for-you Grilled Onion Blossom, hot off the grill. Try this onion blossom tonight. Place on large sheet of foil. Gently pull onion wedges apart; sprinkle with cheese. Drizzle with A.1. Sauce. Wrap tightly with foil. Grill 40 min. or until onion is tender and lightly browned. Prepare onion and wrap in foil as directed; place on baking sheet. Bake in 400ºF oven 45 min. or until onion is tender and lightly browned. For a taste similar to French onion soup, sprinkle with KRAFT Shredded Mozzarella Cheese before wrapping with foil. Sprinkle with 1 Tbsp. chopped fresh parsley before serving.